Planning is underway for a public event celebrating the upcoming August 21, 2017 solar eclipse. The eclipse will begin at 1:07 PM and end at 3:52 PM Eastern Daylight Time. Maximum eclipse will occur locally at about 2:30 PM EDT. Details are developing but the Hiram Eclipse Watch will take place on the Hiram College campus and will be free and open to the general public — everyone’s invited! 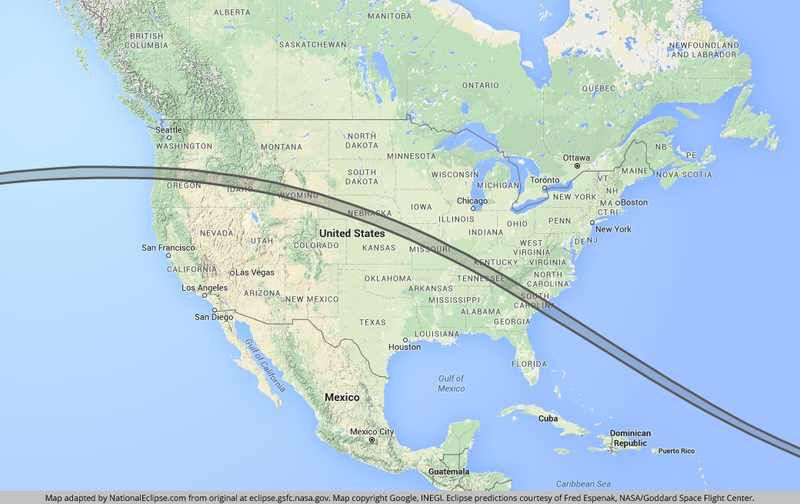 The so-called “American Eclipse” or “National Eclipse” will be a total solar eclipse (Moon covering the entire solar disk) only for those situated on a relatively narrow path stretching from the Pacific Northwest to South Carolina and the Atlantic. For the balance of the Continental United States, the eclipse will be partial — the Moon will cover only part of the Sun. Northern Ohioans will see a bit more than 80 percent of the Sun covered by the Moon reducing the Sun to a brilliant crescent! We have created and are regularly updating a page on this website dedicated to Hiram’s eclipse event; check there for event details as they develop. We hope to see you August 21 for a fun and memorable experience. To reach our Eclipse Watch page see the menu at the top of this page, or click here! 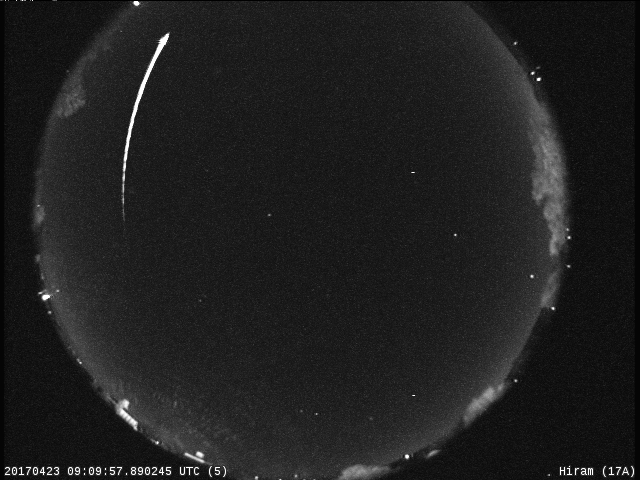 An exceptionally bright and long-lasting fireball meteor was recorded early Sunday morning by the NASA All-Sky Fireball Network camera situated on the campus of Hiram College. The event took place at 5:09 AM EDT, April 23, the meteor streaking from south to north as it burned up entering Earth’s atmosphere. Several other fireball meteors were also recorded during during the night but this was the brightest of the bunch. A fireball is a meteor that glows brighter than the planet Venus. NASA uses data collected from Hiram’s camera along with that from other systems in the network to learn about micrometeorites and their threat to spacecraft. Fireball Network images and data are available to astronomers and to the general public alike, and are updated daily. Click here to visit the All-Sky Fireball Network website. FINAL UPDATE: In all, 18 people and one dog took a chance on the changeable skies and paid the observatory a visit. Cloud cover ebbed and flowed, changing Jupiter’s appearance through the telescope. Interestingly, some of the better views of the planet actually occurred when thin clouds dimmed the brilliant planet cutting the glare. Viewers could make out the gas giant’s two major temperate cloud belts and sometimes one or two more! The four Galilean Moons were visible nearly all of the time. Owing to generally poor viewing conditions, the evening was limited to Jupiter only – dimmer objects were not available. The April 22 program will be repeated in May, given clear skies. By the way, before the dog came, a cat arrived with one of our visitors but refused to come inside, so kitty didn’t count! UPDATE, Saturday, 4:00 PM: Forecasts call for partly- to mostly-cloudy conditions tonight. A final go/no-go decision on opening will be made later but, if we do open, we DO NOT expect to be able to see dimmer objects such as star clusters or the comet listed below. More later…. Stephens Memorial Observatory of Hiram College will be open for public observing Saturday, April 22, from 9:00 to 11:00 PM. This will be the first scheduled Open Night of the 2017 season. The “star” of the night will be planet Jupiter, brilliant in our southeast sky. We will also seek out the M3 star cluster and, later, the Hercules Cluster and (with some luck) Comet C/2015 V2. Other objects of interest may also be viewed. Of course, all of the night’s observing depends upon clear skies and those have been in short supply this spring! Cloudy skies at the starting time cancel the event and, in that case, the observatory will not open. No reservations are required and there is no admission fee for observatory public nights.